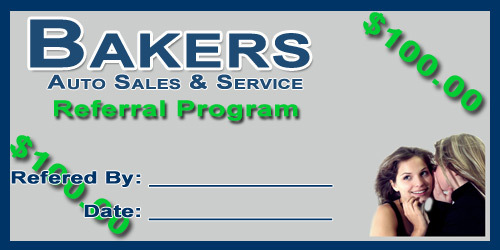 Bakers Auto Sales has started a $100.00 Referral Program. Refer a friend or a family member to Bakers Auto Sales. If that person purchases a vehicle from us we will pay you $100.00. Its that easy. All you need to do is fill out this card and give it to your friend when they come to buy their Vehicle. And you will earn $100.00… please see the rules for clarification. This offer cannot be combined with any other offer. You may refer as many people as you like and be paid only on “completed” vehicle purchases. The following contact form must be presented to the sales rep prior to purchase or financing of a vehicle. Once the vehicle has been purchased and referring individual has taken possession of said vehicle, you will then be paid the referral amount.